We are a team of enthusiastic and experienced teachers and technicians, dedicated to enlightening our students to the wonders of Science. Engaging and thought-provoking lessons are delivered in 11 well-equipped laboratories. During their time with us, students will develop skills of scientific enquiry, observation and a great depth of scientific knowledge and understanding. Science is an extremely relevant and exciting subject and we are committed to not only enabling students to achieve their full potential, but to encouraging the growth of the scientists, researchers and great thinkers of the future. Year 7 are taught 10 Big Ideas over the year, each big idea is revisited twice during the year. The ideas cover all aspects of Biology Chemistry and Physics plus the practical and working scientifically skills necessary to prepare students for GCSE and beyond. The topics they cover are Forces, Electromagnets, Energy, Waves, Matter, Reactions, Earth, Organisms, Eco-systems and Genes. Each topic is made to be interesting and engaging and finishes with an Enquiry Processes investigative task and a topic test, where the knowledge students have gained throughout the topic is assessed. Year 8 also study across Biology, Chemistry and Physics with an emphasis on working scientifically. The curriculum is organised into the following topics Keeping Healthy, Staying Alive, Competition, Energy and Electricity, Motion and Forces, Matter, Chemical Patterns and Waves. Each unit is completed with a topic test. All students will take GCSEs in Science. The majority of students will study the AQA Combined Science (Trilogy) course which will lead to the award of two GCSEs in Science. It is similar to the old Core and Additional Science although it includes new content, as determined by the National Curriculum Programme of Study. A small number of students will be invited to study Separate Sciences. This will depend on students’ ability, prior attainment and their interest in pursuing Science to an advanced level Post-16 and beyond. in Year 9 will be assessed in the GCSE exams. There are a minimum of 30% common marks between Foundation and Higher tiers. What grades can be achieved? Teaching staff will guide students into an appropriate tier of entry, based on ability, prior attainment, literacy and numeracy skills. How is the new course different from the old GCSE Science? a) Planning, b) Making measurements and observations, c) Interpreting and analysing data, d) Drawing conclusion, e) Evaluating procedures. All content is assessed by terminal examinations. least good progress throughout the GCSE course and leave with excellent GCSE results. How we will assess progress? What homework can be expected? All students are preparing for terminal GCSE examinations at the end of Year 11. All students will study AQA GCSE Biology, Chemistry and Physics Unit 1. Students studying Additional and Separate Sciences take Unit 2 in each subject. Students taking Separate Sciences in Biology, Chemistry and Physics take Unit 3. All students have several opportunities to complete Controlled Assessments (ISAs) in Biology, Chemistry and Physics to ensure a successful outcome. Completed a BSc in Medical Science at The University of Birmingham. 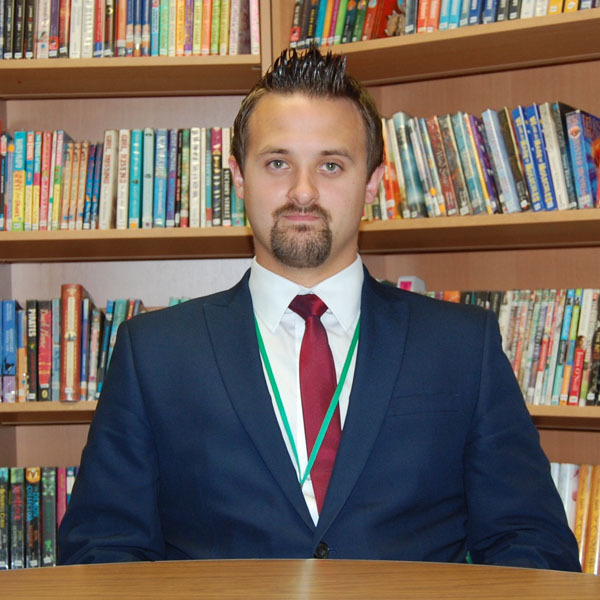 Has taught at Thorns since 2010 and has led the Science department since 2016.